Title speaks for itself. Here is what I measure with my multi-meter. It makes sense to me that since the resistance is stable at both leftmost and rightmost angles, there is no information to be extracted at these angles. The range that the resistance changes with joystick movement is very limited. So, there is nothing to be done - it's a bad joystick, right? The thing is it is the second time I purchase joysticks because of that same reason and the new ones turned out to have the same issue. At this point I am beginning to doubt what I know and wanted to ask to be sure before I go out and buy even more joysticks. Maybe I am doing something wrong? If it is only a joystick issue any product suggestions are welcome. TO THE FINDER... THE ISLE OF KOHOLINT, IS BUT AN ILLUSION... HUMAN, MONSTER, SEA, SKY... A SCENE ON THE LID OF A SLEEPER'S EYE... AWAKE THE DREAMER, AND KOHOLINT WILL VANISH MUCH LIKE A BUBBLE ON A NEEDLE... CAST-AWAY, YOU SHOULD KNOW THE TRUTH! That seems a little bit odd. Have you taken the base apart to see if the mechanical linkage only rotates the pot in the middle part of the rotational range, (i.e. the pot doesn't rotate at the extremes of the range of motion); or if the pot is actually moving over the full range of motion of the control handle? Hmm. You would expect the reach to be a little wider. Perhaps you're looking at a cheap joystick? Yes it is a cheap one. What should a healthy resistance to angle relationship look like throughout the range? 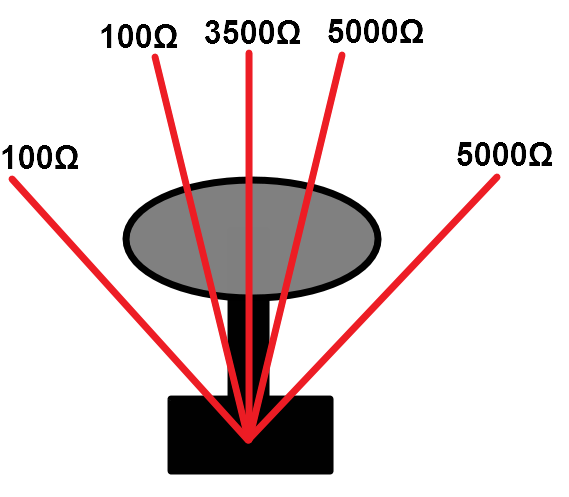 The way a computer is going to read the joystick position is by a voltage to an ADC that varies according to position. Whether this is linear, logarithmic or some weird set of readings that relate position to voltage does not really matter as long as varying position causes varying voltage. You can map readings to physical position in the software as long as there are distinct readings per position. Note that carbon resistor potentiometers do "wear out" and at the end of life the readings may be decidedly non linear! 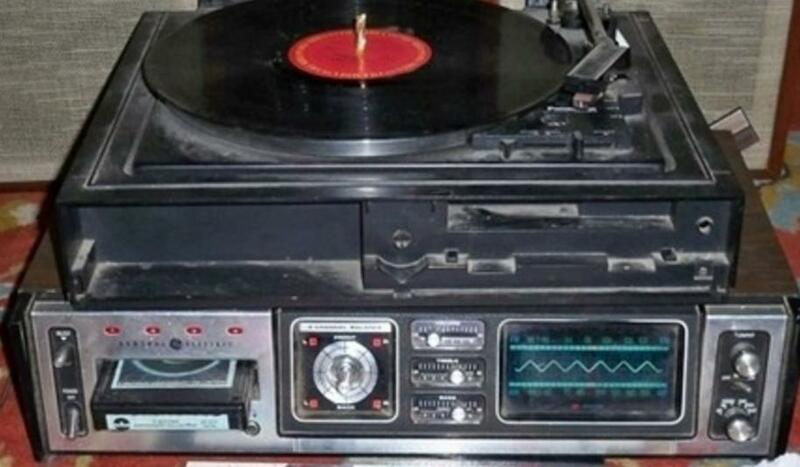 (it's why volume controls on old radio sets used to "crackle" as you adjusted the volume). So rather than just reading resistance with an ohmeter. If you put a potential across the resistor and vary the wiper position what voltage readings do you get on your voltmeter? You can mechanically extend the arm to increase the throw distance and reduce the sensitivity of the joy stick. Or use a mapping function in software to expand/compress the range of values you need to work with. There are two kinds of joysticks. and a separate number for center position. It works with push switches. The other type has two potentiometers. The stick stays where you move it. The pots connect to ADC converters which deliver a pair of numbers (for X and Y) when the stick() function is called. For each direction, the stick only moves 90 degrees. This appears to be spring-centered two-potentiometer type of joystick. They are the cheapest (and most useless in applications). Your result numbers seem to indicate that you are measuring one pot's resistance value while moving the stick in the perpendicular direction for that pot. Add +5V and ground and then measure the voltages on the VRX and VRY pins as the stick is moved in circular direction. Thank you for the help! So, as I take it I bought bad joysticks for the second time... I will stop purchasing online. I'll go on a proper store and measure the products with a multi-meter before I buy them. seem to be rotating just as much as the stick. Only you can carefully watch the Pot as you move the control stick and make sure that the last few degrees of the full range still cause the pot to rotate, and that the ends of travel are not lost to mechanical sloppiness in the gimble mechanism. I would disagree a little bit. I think measuring the pot's resistance is just fine. You don't need to measure the voltage. For historical correctness, BTW, I think that the original IBM PC's used analog joysticks on the "Game Port". They added a Cap and actually measured the RC time constant, so no ADC was needed. The implementation of the RC charge / discharge hitting a threshold varied a bit depending upon the quality of the design and the price point for the Game Port, which was often on an add-in board with an additional serial port or parallel port. I am getting similar voltage behavior with the resistances. Voltage only varies for the region where resistance varies. As expected, no? Yes, just apply 5V and Ground and measure voltage on X and Y pins (relative to GND) while moving the joystick. There is no way to avoid the parallel issue through Gnd and +5V if you use just a ohmsmeter. By the way, cheap joystick is the same as cheap beer, gives you strong problems and headaches. Never buy cheap joysticks, keyboards, mouses, screwdrivers, beer, or ... other things, you will get what you paid for. If you don't have +5V available, you can use +9V battery there, but then the X and Y will swing from zero to 9V. 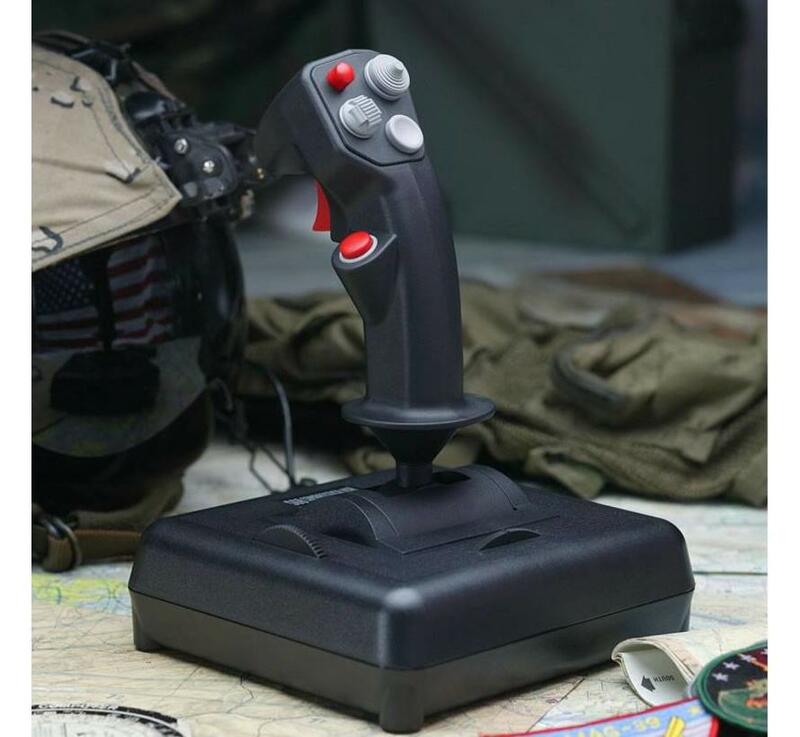 Joysticks are ugly, they are some king of potentiometer that have full swing in less than 40 degrees angle, that is not only ridiculous, it is also not precise. Another problem, normally joysticks are used in unhealthy environments, outside (radio control) it gets humidity and dust, or in hands of kids (you can find all sort of sticky things over their fingers). Many years ago a friend brought me a VHS player to fix, removed the top cover, two half eaten cookies inserted in the slot. Yes, youth don't know what VHS means, lets talk about Dysan 8" floppies index hole adjustment and TDK chromium cassette tapes head level screw. Becoming old is a greek tragedy, isn't it? Measuring / testing with a DMM measuring resistance is fine, one doesn't need to read the voltage. 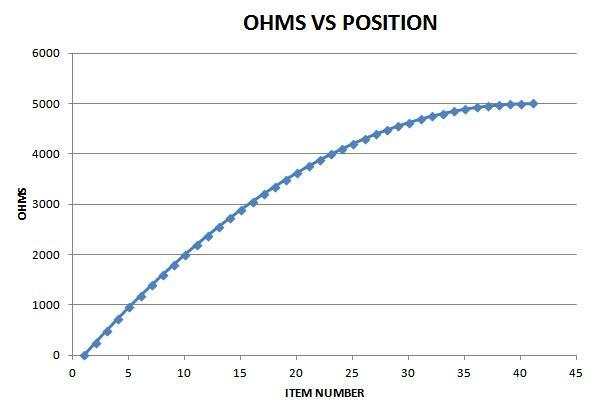 If it is two 10K pots, (as it likely is), then the resistance should swing from roughly 0 ohms to roughly 5 kOhms. It doesn't have to be linear for the test, but it should vary throughout the (roughly) entire range of the pot's motion. The OP's original image shows that that is not the case, both ends of the range of motion demonstrate a flat response, not what is expected. So, take your pick, cheap pots, or cheap mechanical gimbles, or both. And since the OP said they were new, they shouldn't be 'worn out". If the OP needs the full range, then its time to purchase a better joystick. Powering the pot and reading the voltage won't change the results. out to 15000/4 = 3750 ohms. Could be these were designed for a small mounting hole, so there would be limited allowed travel (even though the raw joystick could move further). What's the part number? Maybe this is actually spec'd. Gonna dig out my quadraphonic 8-tracks and jam tonight. Maybe listen to some FM. 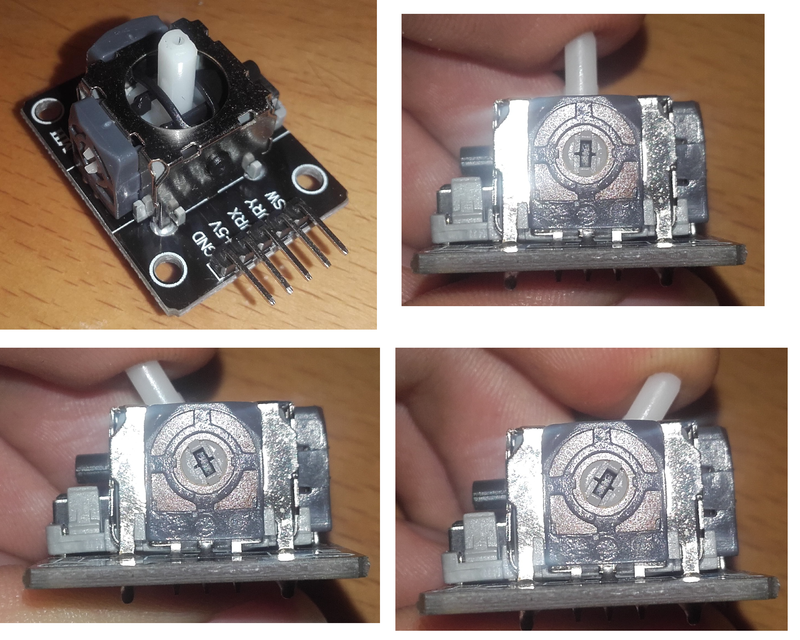 Look at the small circuit board for that joystick... there are two pots, GND and +5VCC connected to the pots extremes, it means, both pots extremities are in parallel. Lets suppose both pots are 5kΩ, measuring resistance in the wiper (in center) of one pot to any of its extremities, will be measuring 2.5kΩ in parallel with 7k5Ω (the other half of this pot in series with the other port), resulting in 1k875Ω. Even if the pots are linear, the measurement results will be not. This is why the right way is feeding voltage to the circuit board and measuring voltage on the wiper. To answer the OP's question one doesn't need to measure the voltage. Agreed, the pots are in parallel. There shouldn't be a flat spot, the resistance, and the voltage, should both vary from one end of the pot's range of motion to the other. So, either it has cheap pots, or it has a sloppy, or poorly designed gimbal. In this case it appears to be cheap pots. Believe me, I can certainly complicate any project. But test this joystick only requires a DMM, and external power supply, albeit rather trivial to set it up either way. True, DocJC, I couldn't think of a better solution than a fine pitch 1/4 turn encoder controlling a digital pot, precise, definite, expensive. Clearly there are joysticks, and then there are joysticks! 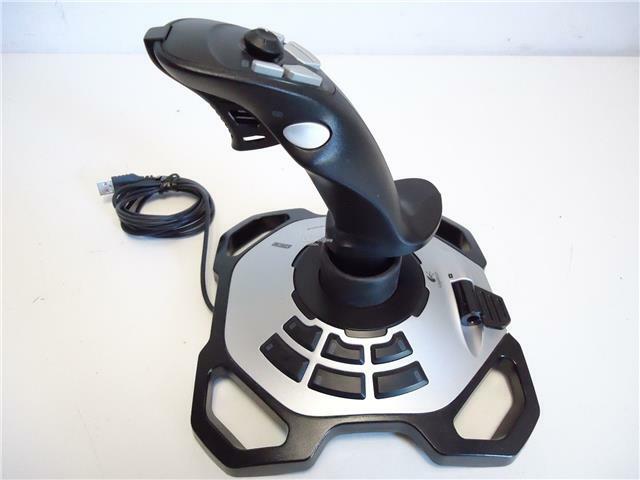 When I "flew" MS Flight Sim, and others, more in the past I used both of these joysticks. They were expensive, but had incredibly smooth and precise functioning.